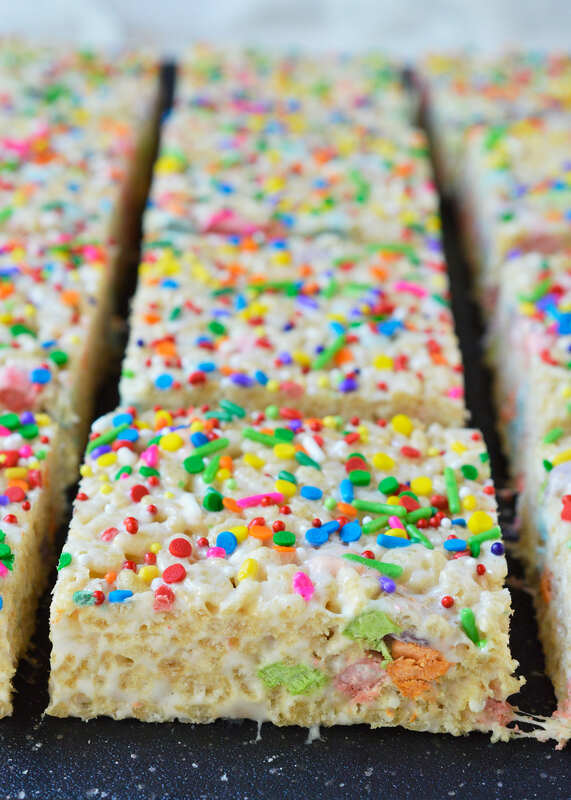 These Magical Rainbow Rice Crispy Treats are perfect for a surprise treat or a colorful unicorn party! 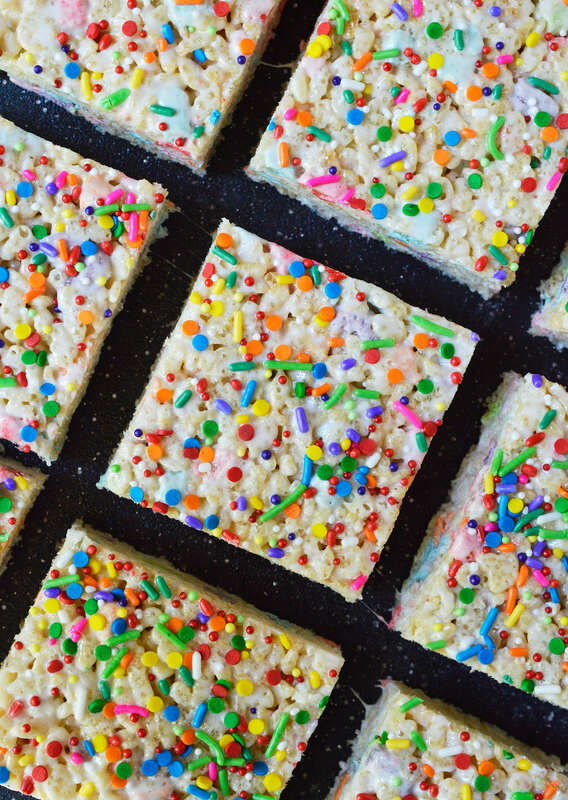 This easy dessert recipe makes super chewy krispy treats full of magical charm marshmallows. Top them with rainbow sprinkles for the ultimate kid approved treat! 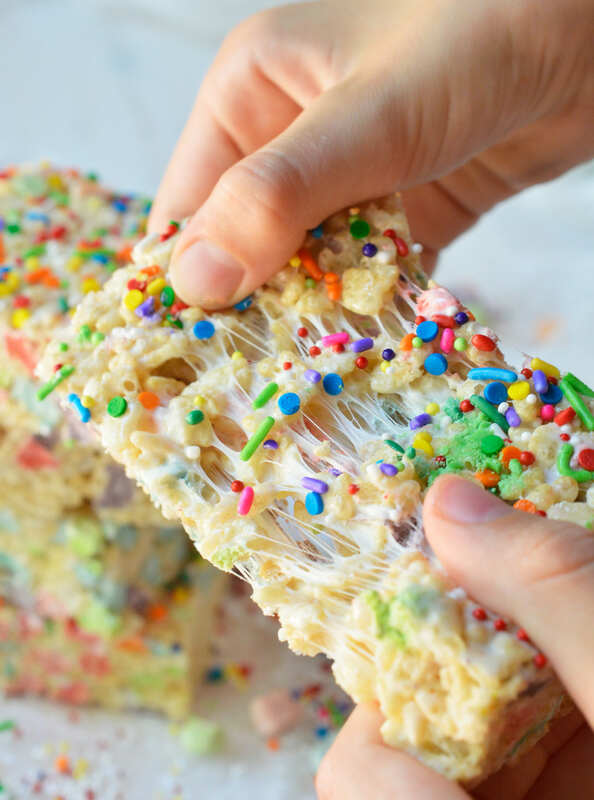 Rice Crispy Treats are my go-to dessert recipe when I need something quick, easy and delicious. Plus, they are always a crowd pleaser! The flavor possibilities are practically endless. So far I have made Jeweled Krispy Treats, Pumpkin Pie Spiced Crispy Treats, Crispy Treats Candy Sushi and even a Rice Crispy Treat Cake! Yep, I like crispy treats. 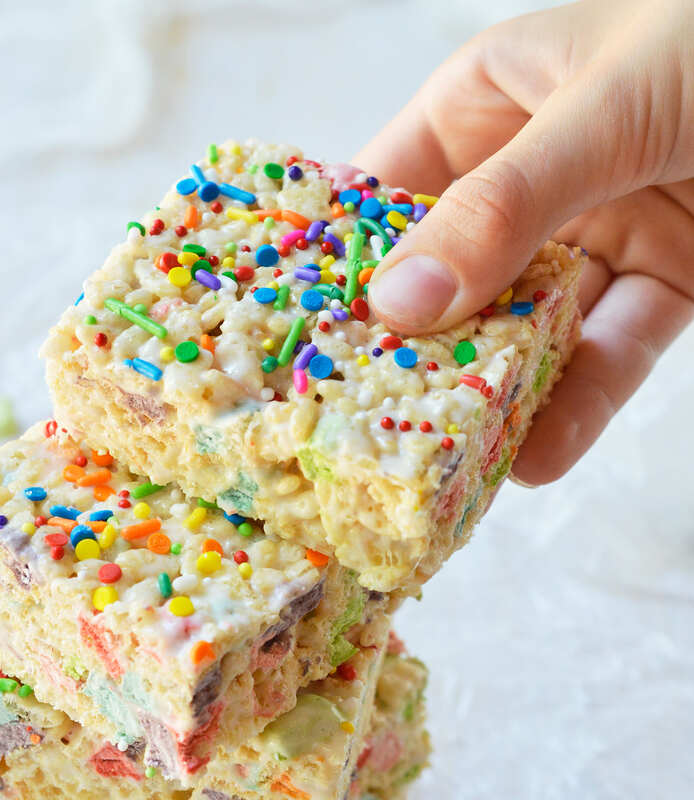 These Magical Rainbow Rice Crispy Treats are super fun! 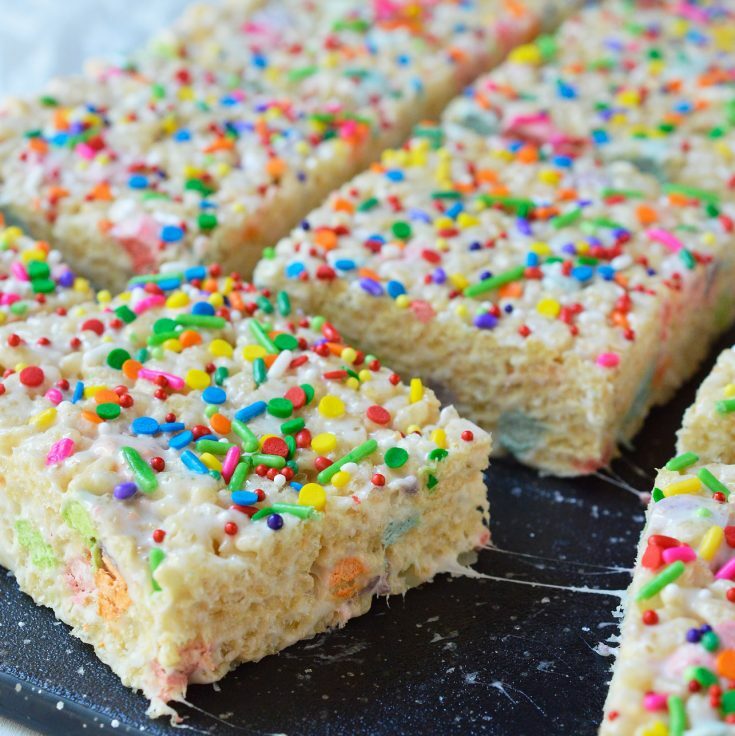 Ooey-gooey-chewy crispy treats filled with magical charm marshmallows (you know, the ones in a certain little leprechaun cereal) then topped with rainbow sprinkles. My daughter and her friends loved these treats. Not that that is a surprise. 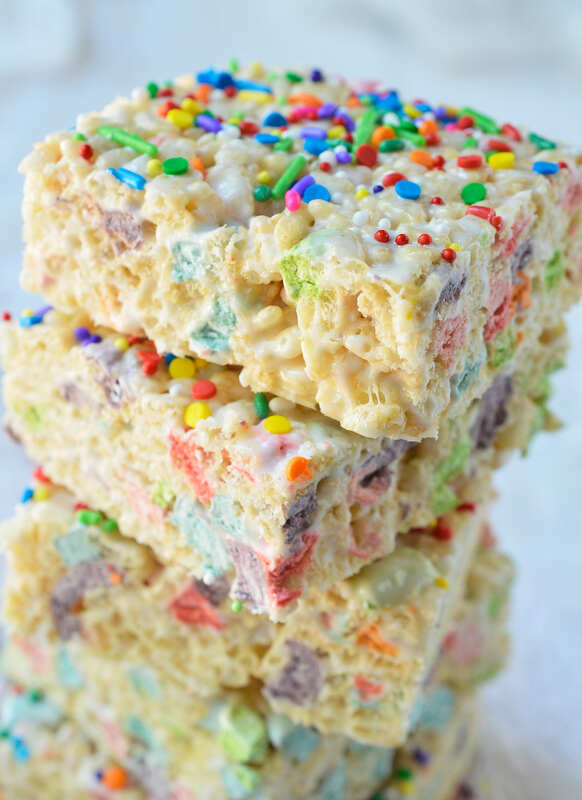 What kids wouldn’t love crispy treats with rainbow colors!?!? And my daughter is absolutely obsessed with the rainbow and unicorn fad that is going on right now. OBSESSED! Look, these treats are so magical that my daughter even cleaned under her fingernails in order to hand model (taste-test) for me! We like our crispy treats extra soft and chewy. I hate biting into a crispy treat that is dry and crumbly. No. Thank. You. 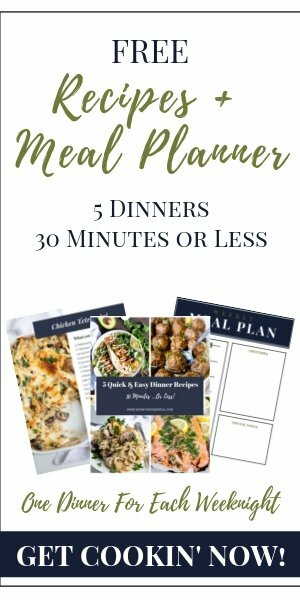 Prepare a 9x13 pan by lining with foil and generously greasing with butter or shortening. In an extra large bowl, combine large marshmallows and butter. Microwave for 2-2½ minutes until marshmallows become a large blob. Remove from microwave and immediately stir in vanilla. Stir until combined and butter is completely melted. Add crispy rice cereal and stir until half way mixed. Then add magic marshmallows and stir mixture until fully combined. Transfer to prepared pan. Press down until crispy treats are even and firm. Top with sprinkle then gently press down to make sprinkles stick. Cover and refrigerate 2+ hours to set. Remove treats from pan and peel off foil. Cut into 12 squares.